Two Regional Express (Rex) pilots flying from Sydney to Newcastle began preparations to land on a coal facility after struggling to locate Williamtown Airport in dark conditions. 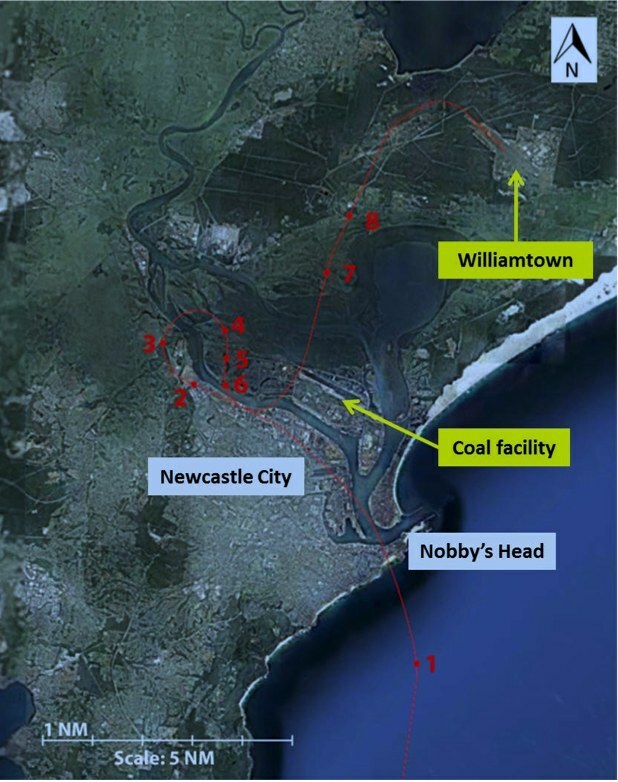 The Australian Transport Safety Bureau (ATSB) report on the November 8 2012 incident found the captain thought the buildings and lights of the Kooragang Island coal facility was Williamtown Airport. Kooragang Island was about 6nm (11km) south-west of the airport. “In the low light conditions and using the visual cues available, the captain incorrectly identified a coal loading and storage facility as the airport environment and manoeuvred the aircraft for an approach to that location,” the ATSB report said. The ATSB report said the first officer (FO) was not confident that he was observing the runway at Williamtown and “also recalled seeing the distance measuring equipment (DME) showing the aircraft to be about 6 NM (11 km) from the airport”, which he thought was a “wider than normal position” for an approach into land. “As the captain was more familiar with the approach, the FO elected not to advise him of the DME distance or his uncertainty over the aircraft’s position,” the report said. Also, the tower controller, with the aid of binoculars, “saw the aircraft manoeuvring at a greater distance than usual from the runway”, the report said. The Saab 340B, VH-TRX, descended to 680ft as part of a visual approach onto what the crew thought was Runway 12 before air traffic control requested the aircraft to climb and directed the flight to Williamtown where it made a safe landing. The ATSB said Rex had alerted its crews to the “possible misidentification of features in the Williamtown area and reminded them of the importance of using navigation equipment to verify their position” in response to the incident. “In addition, crews were advised that visual approaches were no longer to be conducted at Williamtown during normal operations and additional material on situation awareness and assertiveness skills was also incorporated into existing human factors and non-technical skills training,” the ATSB said. Separately the regulator said the Williamtown air traffic control unit reminded its controllers of the “need to provide assertive safety alert instructions, including the provision of minimum sector altitudes and prompt position information to aircraft that deviated from a cleared route, or whose observed position differed from that reported”. The ATSB report noted previous instances where flightcrews had misidentified a runway, such as in September 2000 when a Boeing 737 approaching Adelaide Airport misidentified the Anzac Highway as Runway 05. Some people might wonder how two crew could possibly do this,?! Yes it was a mistake, a very serious one, however it highlights the very real and present danger of the limitations of the human, especially whilst operating an aircraft. As a pilot it is easy to say, ‘I would never do this’ or ‘what were they thinking?’ however there is every chance that it could have happened to any of us. Maybe not exactly, however after reading and studying the case certain external factors and perceptions did not help the crew in this instance. Dusk or dawn conditions and visual flying are often challenging, the runway was aligned in a very similar direction to the lights at the coal facility, the first officer was very new and certain other external factors played a part. Fortunately a ‘safety barrier’ caught the crew before an accident – however this is the perfect example of a ‘Swiss cheese’ style event and we should all learn from it. Agreed in poor visibility it looks like a runway… Human Factors subject matter highlighted.